I greeted this Daring Baker's challenge with some degree of trepidation as tiramisu is not a dessert that I have chosen to eat very often over the years. I have never seen a gluten free version which means my memories are even more vague and I am dredging back a long way for a point of reference. "The perfect Tiramisu is a balance of flavors of a sweet zabaglione, strong coffee, marsala wine, creamy mascarpone cheese and the dusting of unsweetened cocoa. Tiramisu is said to have its origins in Treviso (Italy), and there are quite a few stories about how it came to be created. One story traces the tiramisu as far back as the Renaissance claiming that it was first made in honour of the visit of Grand Duke Cosimo di Medici to Tuscany. Yet another one points to the tiramisu being an adaptation of the "Zuppa Inglese" referring to the sponge cake and cream layered English Trifle. However, experts in this area generally agree that the tiramisu as we know it today, was born in the ‘70s. Some believe that the Tiramisu was created in the the Le Beccherie (a restaurant in Treviso). Others suggest that Tiramisu was first made in 1971 by an Italian baker named Carminantonio Iannaccone in a small bakery in Treviso, Italy." I love the fact that two passionate bakers from India are encouraging us to create a multi-faceted dessert from Italy in our many kitchens all around the world. That is the Daring Bakers for you! For any-one who cares (and that includes me!) tiramisu, or rather tirami su literally means "pick me up" or "pull me up" in reference to the effects of the sugar and espresso in the dessert. There were no shortcuts in this recipe and method, the challenge was made up of 4 technical components, all of which had to be followed in order to successfully complete the challenge. The whole process took me 5 sessions to complete, baking the biscuits and making the cheese in evenings during the week, then starting the zabaglioni and the pastry cream early on a weekend morning before constructing and chilling the dessert later the same afternoon. Of course, as all bloggers know, the dish isn't completed until photographed and written up so that accounts for the final session today. I am very glad that I chose to complete this challenge very early in the month as I think I would have panicked if I had left this to the last minute! very neat!! Great looking tiramisu! Well it looks delicious, I love Tiramasu, but it is often a disappointment. Mind you it seems like a lot of work to get it right! Did it taste as good as it looks? It simply looks great, such a nice clean cut piece! Looks deliicous. I love to see the layers and the creamy look. 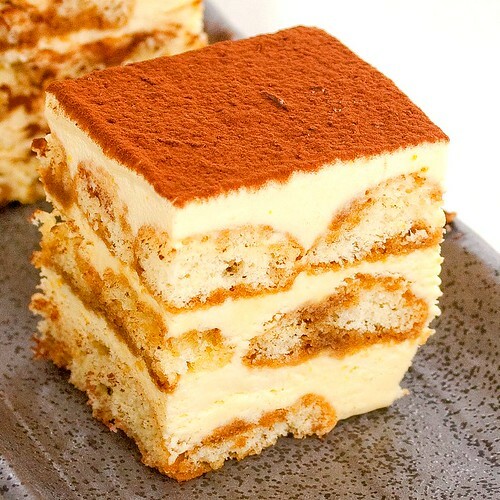 Lovely looking Tiramisu. I can't wait to see the recipes. wow im so envious of your clean, neat slice! great job! Gorgeous! You rocked it gluten-free =D. Your photos blow me away! wow. so beautiful! immaculate execution!! It's like a glorious tower of tiramisu! It looks wonderful! Well done! That looks perfect! I've never been tempted to eat tiramisu but your photo makes me think I might have to try some. Great job! 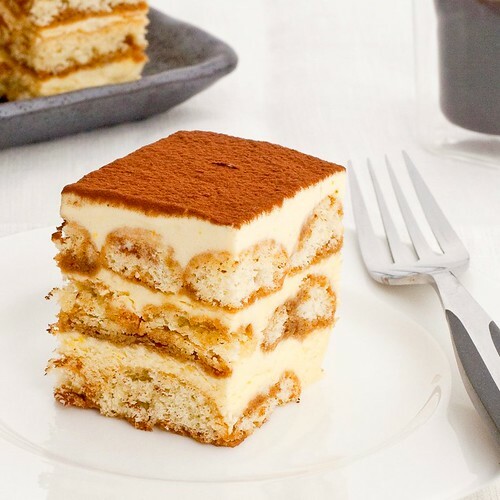 Simply beautiful photos, your tiramisu looks absolutely flawless! Great photo! I'm glad you were able to make it work even through foggy memories. This looks stunning Kate and even though I don't like Tiramisu I quite fancy a bite of one of these pieces. such a perfect and delicious looking slice!